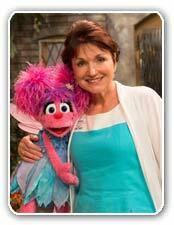 Dr. Pedro-Carroll with Muppet Abby Cadabby in the Sesame Street project: Little Children, Big Challenges, Divorce. Having worked with children and families as a clinical and research psychologist for some 30 years, and having 7 children and stepchildren of my own, I’ve been a huge fan of Sesame Street for many years. So I was especially thrilled when they came knocking on my door and asked me to serve as an advisor for their new initiative: Little Children, Big Challenges: Divorce. This website and a whole host of tools have just been launched, and I’m thrilled to recommend this resource to parents who are somewhere along the continuum of transitions relating to divorce. In a virtual sea of information, advice, and opinion – often conflicting – Sesame Street offers a wealth of solid, research-based information that parents can reliably use for themselves and with their children. More on that another time. Today, I’d love to share my peek behind the scenes at Sesame Street. My work with them began back in March 2011. Job one was to establish the research base for the project, with a focus on what we now understand about how young children experience divorce, what impact it has on them, what factors cause risk to their short- and long-term well-being, and which ones promote their resilience. Once the knowledge base was established, then the creative work of translating it into a story and imaginative yet realistic ways of sharing the important lessons with children and their parents. I was so impressed with the creative team’s dedication to making the scripts and other materials not only accurate for the children’s developmental stages, but also feel completely authentic to them. One of the first strokes of genius was to choose sweet, wispy Abby Cadabby as the primary character — the little girl whose parents had divorced. She is believably vulnerable, and yet she also displays candor and strength in articulating her feelings – a wonderful model for young children. Another stroke of genius was in making Abby’s story a retrospective. In this way, she is able to talk about the mixture of big emotions she had at the beginning (so typical of children in these circumstances) and also reveal how she’s feeling now. It is reassuring to children to realize that what they feel now is not necessarily what they will feel in the future — that they will have more positive feelings as life moves forward and, with their parents love and support, they adjust. In Abby’s case, she tells her friends that although she is still sometimes sad that all of her family no longer lives together in one house (again, typical of children to have these lingering feelings), she is mostly happy. She particularly likes her “two-hug days” of transition between her mom’s house and her dad’s, because both of them show her how much they love her. Abby is a source of important lessons for parents as well as children. The parents’ interactions are respectful and free of the kind of conflict that is very distressing to children. She learns through conversations with Gordon that she did not cause her parents’ divorce, a common misconception that many children harbor and often hide from their parents. And she learns that just as she did not cause the grownup problems her parents have, she cannot solve them. All of this is presented in a normalized environment, with the Sesame Street Muppets sitting around a table, drawing pictures of their homes and talking about their families. This is just one more of the nuances that make it possible for children to relate to and believe in Abby and her friends — and take their experiences to heart. There is much more to say about this wonderful new project. But let me stop for today with this: if you are a parent, grandparent, teacher, therapist, judge, mediator, attorney or anyone else who is seeing a child through divorce, please find your way to Sesame Street’s Little Children, Big Challenges: Divorce.